You are currently browsing the tag archive for the ‘bishop’ tag. Today, I will look at the Diocese of Covington’s response as well as those from two archdioceses. Instead of waiting to gather facts about the incident, the Diocese of Covington in Kentucky — and at least two archdioceses — were quick to condemn the high school students. The boys’ school and the Diocese of Covington joined in the feeding frenzy, hastily issuing a statement of condemnation of the boys as well as a public apology without hearing the boys’ version of the story. “We condemn the actions of the Covington Catholic High School students towards Nathan Phillips specifically, and Native Americans in general, Jan. 18, after the March for Life, in Washington, D.C. We extend our deepest apologies to Mr. Phillips,” the statement reads. Protesters outside the church in #Covington. Not a huge turnout. There are many Catholics, like me, who are having a very difficult time remaining in this Church. The commissars in charge of Covington Diocese are not the only members of the American hierarchy behaving shamelessly during this railroading of innocent young boys. As of this writing, Cardinal DiNardo, president of the USCCB, has uttered not a word in the boys’ defense, nor has he rebuked priests like Father Edward Beck (CNN Commentator) who doubled down on his condemnation of the boys even after evidence proved them innocent. The students claim that after some of the kids spoke to Fox News and other outlets, the Bishop informed the school that he doesn’t want them doing any more interviews. The school faculty agreed, claiming they are worried about their safety. While no punishment was made clear if they fail to comply, the students want to cooperate and plan to do so. Bishop Foys then talked to the students about the statements that have been released by the diocese and the school, which have been criticized. “Some people think our first statement was too strong, but in my mind with what we saw and what we heard at the time, we had to say what we said and we meant it. If that behavior is genuine then we have to condemn it. “We issued a second statement yesterday. Regardless of what you heard or what you’ve read or what you think— I am on your side. I want you to come out of this in a positive light. As Bishop Foys turned the podium over to Mr. Rowe, he expressed his confidence in the principal. “Mr. Rowe has done a wonderful job here in his leadership. I have full confidence in him and he will continue to lead you,” he said. On January 25, Bishop Foys sent a letter to the parents of Covington Catholic High School students. In it was an apology to Nicholas Sandmann and his family. Foys admitted he thought the diocesan announcement of the third-party investigation into the Lincoln Memorial incident would placate venomous critics and acknowledged that did not happen. The Washington Post reports Wednesday that a team of Cincinnati private investigators spent hundreds of hours reviewing footage and interviewing witnesses before concluding that there was no evidence that there were “racist or offensive statements by students to Mr. Phillips.” They did not, however, speak to Nathan Phillips or Nicholas Sandmann, the two people featured most prominently in the encounter. After the results were released, the Bishop of Covington reversed the diocese’s earlier condemnation of the students, noting that “my hope and expectation expressed in my letter to you of 25 January that the results of our inquiry … would exonerate our students so that they can move forward with their lives’ has been realized.” The report doesn’t offer any guidance on how to prevent similar encounters in the future. The Archdiocese of Baltimore condemns the disrespect shown toward a Native American elder during the March for Life. Respect for life demands all are treated with dignity. That tweet received a number of indignant responses, which outnumbered positive ones. Boomer Catholic clergy pass judgment on Catholic high school students before investigating all of the evidence. Why aren’t there more young people at Mass? Very sad that a prominent archdiocese would rush to judgment and gullibly swallow a contrived, libelous attack on young Catholics. You’d do well to delete this tweet. You are WRONG!!! Get the facts. Watch the videos. And CORRECT this tweet. NOW!!! I’ve been preparing my teens that we’ll likely see more aggression towards Catholics. Who knew it would come from a hierarchy that can’t even keep their own accountable for their sins? Our Lady of Fatima, pray for us! The Archdiocese of Baltimore wishes to clarify its message condemning what was widely reported as disrespect toward a Native American elder during the March for Life in Washington, D.C. We reiterate our condemnation of disrespect and denigration toward any person or group based on the color of their skin, their religious or ethnic heritage, or immigrant status. The circumstances of this confrontation at the Lincoln Memorial are now being reported as more complex and it will be the responsibility of school authorities, parents and others involved to determine the actual circumstances, responsibility and consequences. Regardless, it is deeply unfortunate that the annual March for Life was marred by this confrontation. That made their Twitter readers even angrier. Risky business, that. Donations can dry up in an instant. You’ll never receive another dime from me. This is why we refuse to give to the Hope Appeal.Your quick to condemn these young people w/o all the facts yet you covered up pervert priest for years.. Apologize now. Apologize and stop attacking the laity. This explains why the Laity is taking the lead. Because the leadership is not Catholic. It has become apparent, however, that initial reports of that incident were at best incomplete. Those incomplete reports led many, including the Archdiocese of Baltimore, to speak out too hastily. We apologize for doing so. It is our hope that the young people involved were in fact acting in accord with the truth and values that are foundational to Catholic education. We also hope that this sad incident will give to all a renewed determination to respect the life and dignity of every person without exception. Only three people were happy. Everyone else was scathing. Responses from Catholics follow. Interestingly enough, all of the following are from women. Nick Sandmann turned the other cheek and you stabbed him in the back. For once could you put the well-being of teenage boys ahead of your own ambitions? That was such a quisling statement. How about having the courage to unequivocally state that these boys did nothing wrong? So sad that pro-life Catholic boys can’t even depend on their shepherds to stick up for them in the face of persecution. Totally agree! A pretty lame statement. Why was everyone so quick to judge the boys in the shortened video, but afraid to condemn the aggressive behavior of adults (towards kids!!) after seeing the full video? It boggles my mind. This is a cowardly, conforming statement, at best. We are lost. I wonder if the archdiocese thought its tweets on Catholic schooling were somewhat misplaced the following week. I accept that it was Catholic Schools Week, but when Covington Catholic High School and the diocese weren’t defending their students, one wonders. A little snow and freezing temperatures cannot stop the joy of Catholic Schools Week. Oh so generously, the Archdiocese of Baltimore felt it could finally support the students. Pah. Citing the public release today by the Diocese of Covington of the Final Investigative Report into the January 18th incident at the Lincoln Memorial in Washington, D.C., the Archdiocese of Baltimore joins Bishop Roger J. Foys, Bishop of Covington, in expressing its support for the students of Covington Catholic High School. The independent investigation, conducted by a third-party firm with no connection to Covington Catholic High School or the Diocese of Covington, found that “our students did not instigate the incident that occurred,” Bishop Foys said. As previously related, the Archdiocese regrets communicating before all the facts were known about the unfortunate confrontation that occurred at the Lincoln Memorial with other demonstrators. Furthermore, the Archdiocese of Baltimore again commends the students from Covington and across the nation who participated in the annual March for Life in witness of their active faith and defense of the sanctity of human life at every stage. By then, Twitter readers must have been fed up. The tweet only garnered four responses: three negative and one positive. At least you finally responded in the right way. My ongoing complaint and criticism remains: You act like pansies without a backbone unwilling to take a strong stance on any issue (esp Catholic issues) unless you have the support of a corrupted society. I keep praying for you. @archbalt didn’t support #CovingtonCatholic Needed an “independent investigation” in order to clear youths’ reputations. What a bunch of cowardly shepherds. Skulking under their skullcaps. Creeping behind their croziers. You should be embarrassed. When the ex-con fake vietnam vet got in this child’s face, his Indian friend yelled racial slurs at the white kids. The Indians then attempted a hate-crime by trying to disrupt a Catholic Mass. How sad you attacked these pro-life teens. SHAME! The Archdiocese of Baltimore never should have said a thing. Closer to home, the Archdiocese of Louisville chimed in. Over the past few days, I have received many calls and email messages from people with many different viewpoints and seemingly opposite messages about the incidences involving Covington Catholic High School students at the March for Life. Many of these calls and messages have revealed the regrettable polarization in our Church and in our society. As many have noted, over the weekend, I joined Bishop Foys in a condemnation of alleged actions, not people. This post replaces that original blog entry with the additional information below from the Diocese of Covington. I do not have jurisdiction in the Diocese of Covington. However, I have sought to act in solidarity with the Bishop of Covington, who is in a position to have the best information about what transpired and who has pledged an independent investigation of the situation. (See the statement from the Diocese of Covington below.) At this time, I am not going to get ahead of the Diocese of Covington’s independent investigation with additional comments. I want to assure those who are concerned that I am confident that Bishop Foys and the school will reach out and respond to those who were impacted by these events and media reports. Whatever the investigation reveals, I hope that we can use this as a teachable moment, learn from any mistakes on the part of anyone involved, and begin the process of healing. That, too, was pretty lame. The last sentence in particular suggests that, somehow, someone did something woefully wrong. I offer further reflections about the events at the March for Life involving Covington Catholic High School students. Today’s letter sent by Bishops Roger Foys to Covington Catholic High School parents is a good description of what has transpired since the events at the March for Life. Since I joined with Bishop Foys in condemning the alleged actions by Covington Catholic students, I apologize for what was a premature statement on my part based upon incomplete information. I very much regret the pain and disruption in the lives of the Covington Catholic community and in the broader Church and society. I support Bishop Foys in his efforts to investigate fully what happened, to learn from mistakes, and to take any action needed to address the harm done to anyone from the events that occurred last Friday at the March for Life. There is a great deal to be learned about the risk of responding to social media and media reports without additional analysis and especially the need to elevate our discourse and to foster the much-needed skills of listening, dialogue, and mutual understanding. After the Covington Catholic High School boys had been cleared of wrongdoing, nothing to that effect was posted on the archdiocesan website. One cannot help but think the Archbishop really wanted someone to be expelled. As if the boys hadn’t suffered enough — for doing nothing wrong. If nothing else, this painful debacle proved the truth of the New Testament to the boys that followers of Christ will be persecuted. It’s a pity that their own clergy had to join in that persecution: Pharisees, every last one of them. I will look at the legal angles in another post. I meant to write about them last week, but that worked out just fine, because the story gradually progressed to a happy ending. On Wednesday, February 13, the Diocese of Covington has cleared the boys of any wrongdoing. Nonetheless, the story needs telling in full. The mainstream media is losing their minds over a few kids standing in front of a Native American as he played his drum. But when have they ever expressed outrage over Trump supporters being verbally accosted and physically attacked for wearing #MAGA hats? From CJ Pearson 👉 getting new submissions every 30 seconds. Every member of the media who defamed, slandered, and doxxed the #CovingtonBoys on Twitter will be served. was on their side and drumming along to their cheer. The families also wanted to make it clear that there were no chants of “build the wall,” or anything else that could be seen as offensive. Mrs. Smith recited one of the Covington chants, saying that it could have been what Phillips heard. Mrs. Adams said that she is worried about the safety of the students on Tuesday when they return to school. The American Indian Movement Chapter of Indiana and Kentucky has called for a protest at the high school. Mrs. Adams added that the worst for her has been the Bishop of Covington throwing them under the bus. “That is the worst thing to me,” she said, her voice shaking. The Gateway Pundit asked the families if there is anything they would like to say to the Democrat mob of adult journalists and celebrities that are coming after their children. “I don’t think you could publish it,” Mrs. Smith said, taking a break from the righteous outrage for some laughter. “These students aren’t adults, these are kids — innocent children — and the adults should pause before they react when it’s children’s lives that could be ruined,” Mrs. Smith said. “And kids are so susceptible to bullying. I honestly thought, this kid could kill himself over this. What are they thinking? They could destroy this boy’s life, depress him, and he could end up committing suicide — and he did nothing wrong! These people, who are supposed to be adults, are jumping in and accusing him of terrible things — shame on them! Shame isn’t even enough of a word,” Mrs. Smith demanded. Adam Smith noted that many of the children on the collage of photos that is being passed around the internet, looking for their names, are as young as 14-years-old. Many of them are freshmen. Online scrutiny then turned to the Native American, allegedly a left-wing activist who appeared in a 2012 anti-police video, and thought to have been involved in a 2015 incident targeting a group of university fraternity members. In that incident, he also claimed he was abused, when it appears he instigated it. Questions were raised about the timing of and his rank during his military service. Even the Washington Post had to correct one of their stories, retracting a mention of his service in the Vietnam War. Someone else unearthed his family history and past interviews with the media, which raised more questions about him. Another Native American protester with him acknowledged that the two of them decided to join in solidarity with the group harassing the students. Imagine being Nick. One day you are on a field trip – next day the President of the United States got your back. That’s life in the Maga lane. The President understands loyalty better than many Bishops & ‘Catholic’ Teachers. Think about that. He fights for us. This is proof. Digital company INE Entertainment has fired a journalist who publicly wished for the death of several Covington Catholic High School students and their parents in a pair of tweets over the weekend. Aside from his job as a post-production supervisor at INE, Erik Abriss is a contributor to New York Media’s pop culture site Vulture. “We were surprised and upset to see the inflammatory and offensive rhetoric used on Erik Abriss’ Twitter account this weekend. He worked with the company in our post-production department and never as a writer,” the company said in a statement to TheWrap on Monday. The Wrap included the text of the offending tweet. We are working with 16 families. Adding more soon. We’ve agreed to hosting a townhall. America must hear what’s been done to these families. The Media has bent over backwards to defend my Parkland Highschool liberal peers, no matter what outrageous things they have said. But now they have tried to ruin a highschool kid’s life, over fake news. What changed? The student was a Trump Supporter. “No apology. No explanation. No news on protests planned for tomorrow. No cancelling of school. Nothing,” she said. The far-left radical activist group the “American Indian Movement” and Antifa have called a protest for Tuesday when the students are supposed to return to school. Two mothers that have spoke to The Gateway Pundit have both said they will not be sending their children to school tomorrow out of fear for their safety. A mother who received the call tells the Gateway Pundit that it was a recorded message from the principal saying that they decided to close the school after discussions with local authorities. They said that there were security concerns and no parents or children are permitted on campus throughout the day or for any evening activities. The recording also asked that parents continue to pray for the school. “It sounded serious, like they had some serious threats to call it off like that after they planned for it to be open,” the parent told TGP. The parent also expressed frustration at the fact that they hadn’t cancelled sooner — as the threats were everywhere. A local Antifa group and a far-left Native American group have called for protests at 10 a.m. on Tuesday at the school — though the Natives have reportedly moved their protest to a church. This is the only statement that has been made by the Sandmann family. Any comments attributed to any member of the family that is not contained in this document are fabricated. The family will not be answering individual media inquiries. As there are a number of other aspects to this story, I will continue next week. 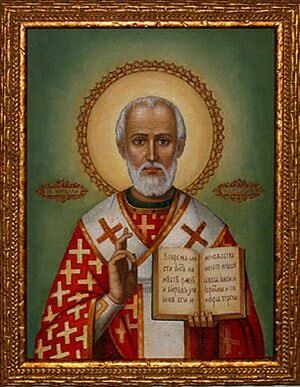 St Nicholas Day is December 6. In many countries around the world, especially the West, children follow the ancient tradition of putting a shoe or small stocking outside their bedroom door and parents quietly slipping a treat in it during the night. St Nicholas is a great role model for children. It is worth telling them about the holy life he lived, how aware he was of others’ plights and how he turned desperation into dreams for many people. The Most Rev Bishop Michael Curry, the first black presiding bishop and primate of the Episcopal Church, gained worldwide attention with his address at Prince Harry and Meghan’s wedding on Saturday during which he evoked Martin Luther King and spoke of poverty and injustice. Mr Curry, along with the gospel choir, brought a flavour of the American bride’s homeland with the speech at St George’s Chapel in Windsor. One of my readers, longtime Episcopalian blogger, underground pewster, wrote a sharp analysis of the sermon on May 23: ‘Bishop Curry: All You Need is Love’. It is a must read, especially for fellow members of the Anglican Communion. As pewster has probably put a lot of work into this, only a taster follows. There’s power in love. Don’t underestimate it. Don’t even over-sentimentalize it. There’s power – power in love. If you don’t believe me, think about a time when you first fell in love. The whole world seemed to center around you and your beloved. I think he is equating two different types of love. Uh oh, following “it feels right” can lead you into all kinds of problems. It would have been helpful if he had defined what type of love he was talking about, and that is one of the major weaknesses of his sermon. While there is nothing wrong about preaching on love, it requires a deeper exposition. The love of God and the love of Christ for the world, God’s love for the Church, and God’s intended love between one man and one woman are things that most Episcopalian Bishops are incapable of communicating. No one expected Bishop Curry to talk about complementarianism, and no one expected any major digressions into his favorite themes, so his sermon appeared benign if not great to most of his viewers. It had to sound benign you see, because he could not say the words that he really wanted to say about his novel ideas about what makes up a Christian marriage in front of an audience of two billion people because those words are so unbiblical that the effect on his sect would be ruinous. Maybe we haven’t supported enough liberal causes, maybe we haven’t marched in enough gay pride parades, maybe we haven’t celebrated enough gay marriage ceremonies in the Church, maybe we have been sending those e-mails from The Episcopal Public Policy Network into the Spam box, maybe we haven’t performed enough abortions, maybe we haven’t brought enough lawsuits against faithful Christians, or maybe we have been critical of the Episcopal sect in print and on social media. And you know what they call people who go against the zeitgeist, those who disagree with Bishop Curry and his unbiblical agenda, an agenda that he was afraid to verbalize in front of an audience of billions? Wait a second! God revealing himself, and dying for us was the number one world changing event in human history. Fire makes all of that possible, and de Chardin said fire was one of the greatest discoveries in all of human history. And he then went on to say that if humanity ever harnesses the energy of fire again, if humanity ever captures the energy of love – it will be the second time in history that we have discovered fire. Dr King was right: we must discover love – the redemptive power of love. And when we do that, we will make of this old world, a new world. 2:1 When the day of Pentecost had come, they were all together in one place. 2:2 And suddenly from heaven there came a sound like the rush of a violent wind, and it filled the entire house where they were sitting. 2:3 Divided tongues, as of fire, appeared among them, and a tongue rested on each of them. 2:4 All of them were filled with the Holy Spirit and began to speak in other languages, as the Spirit gave them ability. With all the preaching about fire, couldn’t he have mentioned that May 20 — the morrow — was Pentecost Sunday? I would have done a sermon on the divine gifts from the Holy Spirit that can enrich a Christian marriage. It’s not that difficult and would not have gone off track. Then again, sadly, we are dealing with today’s Episcopal Church. Curry’s sermon exemplifies the weak theology we so often see not only in the Episcopal Church and the wider Anglican Communion but also in other established churches, including the Catholic Church. We are infested with unbiblical messages, especially many that, like Curry’s, ‘sound nice’. The truth of the matter is that biblical Christianity offends. That said, its challenges can — and should be — presented in a winsome way, to encourage people to live in a Christlike manner. It’s a shame that yet another cleric missed yet another opportunity — this one on a grand scale — to tell that truth. Is it any wonder Anglican churches are closing in so many English-speaking countries? This year, I have been running a series of posts on Percy Dearmer‘s 1912 volume, Everyman’s History of the Prayer Book, published by Mowbray. In that last post about the tumultuous events leading to the restoration of the monarchy in 1660, Percy Dearmer emphasised the joy that Anglicans felt on being able to use their once-forbidden Prayer Book again. In fact, demand was so great that it was reprinted five times that year. Consensus was that a new Prayer Book was needed. The one in use dated from 1604. Even after the Restoration, memories of Charles I’s beheading and the oppressive Puritan Interregnum were still fresh in the minds of the English people. The new Parliament passed laws ensuring that Puritans and other non-Conformists — called Dissenters during that new era — and Catholics were prohibited from holding public office and more. their worship forbidden by the Conventicle Act of 1664 under a final penalty of transportation, their extremer ministers refused permission to come within five miles of a town by the Five Mile Act of 1665, and their conscientious members debarred, in common with Papists, from all civil, military and naval office by the Test Act of 1673.
to their native villages at the Restoration, to find the church smashed, the trees felled, and the home of their ancestors destroyed. The Puritan ministers also, who were ejected, were, after all, themselves intruders; for there had been a worse ejectment of Anglicans before. Above all this, there loomed in men’s minds the indelible memory of the martyrdom of King Charles. The Puritans were not going to give up easily, however. and asked that, as the Prayer Book had long been discontinued, the King should not use it when he landed. They also asked that his chaplains should give up using the surplice. with his usual keenness of wit, that he would not be restrained himself when others had so much indulgence. that the Prayer Book might be made like the liturgies of the Reformed Churches. In October 1660, King Charles declared that a conference would take place the following year to discuss a new Prayer Book. The Savoy Conference convened on April 15, 1661. It lasted over two months. In attendance were 12 Anglican bishops and 12 Presbyterian divines. Each side also had nine assistants, called coadjutors. The Puritans expressed their usual complaints about the use of the word ‘priest’, the frequent participation of the congregation in prayers, kneeling for Communion, the use of wedding bands in the marriage ceremony, commemorating saints’ feast days, the Catholic nature of vestments and even the use of the word ‘Sunday’. The Bishops replied to such criticisms as these by referring to Catholic usage, and to a Custom of the Churches of God, agreeable to the Scripture and ancient, and to the Catholic Consent of antiquity. Dearmer gives us summary statements from both sides. To load our public forms with the private fancies upon which we differ, is the most sovereign way to perpetuate schism to the world’s end. Prayer, confession, thanksgiving, reading of the Scriptures, and administration of the Sacraments in the plainest, and simplest manner, were matter enough to furnish out a sufficient Liturgy, though nothing either of private opinion, or of church pomp, of garments, or prescribed gestures, of imagery, of musick, of matter concerning the dead, of many superfluities which creep into the Church under the name of order and decency, did interpose itself. To charge Churches and Liturgies with things unnecessary, was the first beginning of all superstition. If the special guides and fathers of the Church would be a little sparing of encumbering churches with superfluities, or not over-rigid, either in reviving obsolete customs, or imposing new, there would be far less cause of schism, or superstition. It was the wisdom of our Reformers to draw up such a Liturgy as neither Romanist nor Protestant could justly except against. For preserving of the Churches’ peace we know no better nor more efficacious way than our set Liturgy; there being no such way to keep us from schism, as to speak all the same thing, according to the Apostle. This experience of former and latter times hath taught us; when the Liturgy was duly observed we lived in peace; since that was laid aside there bath been as many modes and fashions of public worship as fancies. If we do not observe that golden rule of the venerable Council of Nice, ‘Let ancient customs prevail,’ till reason plainly requires the contrary, we shall give offence to sober Christians by a causeless departure from Catholic usage, and a greater advantage to enemies of our Church, than our brethren, I hope, would willingly grant. The one thing both sides did agree on was including Scripture readings from the Authorised — King James — Version of the Bible. The Savoy Conference ended on July 24, 1661. On November 20, 1661, a committee of Anglican bishops was appointed to revise the Prayer Book. They completed their work on December 20. The Convocations of the Archbishops of York and Canterbury approved the Fifth Prayer Book. On February 25, 1662, the new Prayer Book was annexed to the Bill of Uniformity. After passing both Houses of Parliament, the Bill of Uniformity received royal assent on May 19. The legislation then became the Act of Uniformity, and the Fifth Prayer Book — the Book of Common Prayer — was made mandatory for public worship in the Church of England. And so it remained until 1984. It is sometimes said as a jibe against the Prayer Book that it is part of an Act of Parliament. our present Prayer Book was not one whit less the work of the Church, whose rights and liberties were most carefully safeguarded at every stage. The troublous century which we call the Reformation Period began with tyranny and oppression, but it ended with the establishment of constitutionalism in 1662; and the royalist Parliament which enforced the settlement, did at least represent the people. The next entry will concern the 1662 Book of Common Prayer itself. Conversions of convenience or the real thing? In the early 21st the worldwide migration situation has produced Church-related anomalies in Europe, including the UK. to get around immigration controls and require immigrants to obtain a special certificate of approval, or COA before they can wed in the UK. The overturning of the marriage laws due to unfair discrimination against immigrants on religious grounds leaves the door open for hundreds of people from overseas getting married in the UK. The test case involved in overturning by Mr Justice Silber, involved a foreign national from Algeria and an EEA national who was legally living in the UK. Once Mahmaud Baiai and Izabella Trzanska from Poland were refused permission to marry, they launched the challenge. Mr Justice Silber said the case raised issues under Article 12 of the European Convention on Human Rights, which protects the right to marry and found a family. “The rules were incompatible because they discriminated against immigrants rights subject to immigration control on grounds of religion and nationality,” he declared. even if they are illegally in the UK. the number of bogus weddings performed by Anglican priests has risen by as much as 400 per cent in some dioceses over the last four years. Foreign nationals have turned to the Church because it is exempt from rules that require all foreign nationals from outside the European Union to obtain a Home Office certificate of approval to marry in a register office. the Rt Rev Tom Butler, Bishop of Southwark, urged priests to be wary of migrants looking to get married who have obtained a common licence – a preliminary for church weddings involving foreign nationls. “The new regime does not apply to marriages by banns, common licence or special licence, which probably explains the substantial increase in demand for bishops’ common licenses,” he writes. The Rt Rev Richard Chartres, the Bishop of London, has also written to churches in his diocese with guidance on how to tighten measures. The diocese of Southwark, which covers Greater London south of the Thames, has seen the number of applications for common licences rise from 90 in 2004 to 493 last year. Notices of marriage following civil preliminaries or civil partnership in England and Wales involving a non-EEA national who could benefit from it in immigration terms will be referred to the Home Office for a decision as to whether to investigate whether the marriage or civil partnership is a sham. Non-EEA nationals will only be able to marry in the Church of England or the Church in Wales following civil preliminaries, except in limited circumstances. Perhaps something similar should be done in the case of conversions by refugees to Christianity. On June 5, The Guardian reported that the Catholic bishops in Austria are suspicious of the number of sudden converts to Christianity among refugees from war-torn countries. The paper reported in 2014 that the same phenomenon is going on in the Lutheran Church in Germany. Clergy with a rosy view of the world will say that this is a tremendous opportunity to revive the Church in Europe. the Austrian bishops’ conference published new guidelines for priests, warning that some refugees may seek baptism in the hope of improving their chances of obtaining asylum. “Admitting persons for baptism who are during the official procedure classified as ‘not credible’ leads to a loss in the church’s credibility across the whole of Austria,” the new guidelines say. There has to be a noticeable interest in the faith that extends beyond merely the wish to obtain a piece of paper. Austrian priests now informally evaluate potential refugee converts during their one-year ‘preparation period’. The Archdiocese of Vienna has recorded that 5% to 10% of potential converts drop out of the process prior to baptism. In England, however, Anglican clergy are eager to not only ask no questions but to combine the conversion process with helping to ease the refugee application process. The Guardian interviewed the Revd Mohammad Eghtedarian, an Iranian refugee and convert who was later ordained. He is a curate at Liverpool’s Anglican cathedral. Eghtedarian says that refugee status and religious affiliation are intertwined. Liverpool Cathedral has a process which involves registering refugee attendance, which helps their asylum applications. A candidate for Baptism must attend the five preparatory classes. A baptised refugee seeking Confirmation must attend a dozen courses. Hmm. It sounds very minimal. The Guardian asked Eghtedarian about the sincerity of those candidates. Even he acknowledged that ‘plenty of people’ were converting for convenience! In large part, only a cursory examination exists. The Cathedral will also provide a ‘letter of attendance’ to immigration authorities, if requested. The article said that the Church of England does not record conversions, regardless of background, because it could be a ‘sensitive’ issue. It seems the Austrian Catholic bishops have approached the conversions of convenience issue more sensibly than the German Lutherans, who resent that immigration court judges ask refugees to discuss their newly-found beliefs in detail in order to assess their sincerity. It is the responsibility of clergy to do a thorough examination of heart and mind during the conversion process rather than let false converts through the doors for Baptism and Confirmation. Church of England clergy should pray for divine guidance on the matter rather than deceive fellow Christians, other citizens of our country and our government. Admittedly, some of these converts are sincere. However, if ‘plenty of people’ are not, then the whole thing is a sham. If marriages of convenience rightly rang Anglican bishops’ alarm bells, then conversions of convenience should, too. Not a day goes by in Britain now without a warning from pro-EU Conservative government ministers about Brexit. We’ll have a recession. Well, that’s probably on the cards, anyway. The stock market will crash. That, too, is possible — Brexit or not. It won’t just be in the UK, either, but also in Europe and elsewhere in the West. The latest is that house prices in Britain could plummet. For under-40s living in London and the Home Counties, that comes as welcome news. The bottom line is that no one knows exactly what is going to happen. And most of what actually happens is unlikely to have anything to do with our position in or out of the European Union. The Most Revd Peter Smith, Catholic Archbishop of the Archdiocese of Southwark (encompassing South London to the South Coast of England), has criticised the government’s Project Fear — as Brexit supporters call it. The archbishop is the first senior cleric — Catholic or Protestant — to express empathy with Brexit, although he says he is still undecided. On May 19, he gave an interview on the subject to Vatican Radio, which has the full audio. On May 23, The Catholic Herald published an article on the interview, which is well worth reading. Archbishop Smith, the vice president of the Bishops’ Conference of England and Wales … criticised the Remain campaign for attempting to “scare” the electorate into voting to stay in the EU when they go to the polls on June 23. He dismissed as “ludicrous” the bleak economic forecasts predicted by George Osborne, the Chancellor of the Exchequer, in the event of a Brexit win. “I am very sceptical of the arguments the Chancellor makes. When he does a budget each year very often by the end of the year his forecasts are all over the place. He added: “Most people are completely puzzled. They don’t know what the real arguments are and then they hear these scare stories like the Chancellor saying in 14 years’ time we will £4,000 plus less (worse off). “There has been a lot of emotional speculation and so on,” he said. Outside of Brexit: The Movie, he is right. Archbishop Smith makes good points, especially as a party of one. It must be lonely being the sole major cleric to see the benefits of Brexit. This post continues my series on hell. If you haven’t read about Origen’s unorthodox views on hell which are currently infecting the Church, please do so. J C Ryle (1816-1900) was undoubtedly one of the greatest Anglicans who ever lived. Educated at Eton and Christ Church, Oxford, his parents expected him to enter politics. However, Ryle felt called to the priesthood and was ordained in 1842. He was very much an evangelical preacher, firmly opposed to the Ritualism in the Church as characterised by the Anglo-Catholic Oxford Movement of the time. Although he had firm religious convictions which he expressed in no uncertain terms, in private, he was known for his kindness and warmth. He also preached to the working class, bringing many to the knowledge and love of Christ Jesus. One of Benjamin Disraeli’s last acts as Prime Minister was to appoint Ryle to the post of Bishop of Liverpool, a brand new diocese. There, Ryle presided over the construction of 40 new churches, raised clergy salaries and instituted pension funds for them. He was also responsible for the building of the Anglican cathedral in Liverpool. Ryle retired only three months before he died at age 83 in 1900. Today, he appears to have more of a following in the United States among orthodox Protestants than he does here in England. He published several works on the four Gospels as well as on the Christian life. My chief desire in all my writings, is to exalt the Lord Jesus Christ and make Him beautiful and glorious in the eyes of men; and to promote the increase of repentance, faith, and holiness upon earth. Every professing Christian is the soldier of Christ. He is bound by his baptism to fight Christ’s battle against sin, the world, and the devil. The man that does not do this, breaks his vow: he is a spiritual defaulter; he does not fulfil the engagement made for him. The man that does not do this, is practically renouncing his Christianity. The very fact that he belongs to a Church, attends a Christian place of worship, and calls himself a Christian, is a public declaration that he desires to be reckoned a soldier of Jesus Christ. You can read his views on the Christian life and his analysis of English Puritan clergy. GraceGems has an extensive collection of Ryle’s sermons and books which you can read online. Ryle’s written works include commentaries on the gospels. What follows is an excerpt from Ryle’s Expository Thoughts on Matthew. It is from his commentary on Matthew 26:14-25. Emphases mine below. We ought frequently to call to mind the solemn words, “What shall it profit a man if he gain the whole world, and lose his own soul?” “We brought nothing into this world and it is certain we can carry nothing out.” Our daily prayer should be, “Remove far from me vanity and lies: give me neither poverty nor riches; feed me with food convenient for me.” ( Proverbs 30:8). Our constant aim should be to be rich in grace. “They that will be rich” in worldly possessions often find at last that they have made the worst of bargains ( 1 Timothy 6:9 ). Like Esau, they have bartered an eternal portion for a little temporary gratification; like Judas Iscariot, they have sold themselves to everlasting perdition. Let us grasp this truth firmly, and not let it go. There are always persons who deny the reality and eternity of hell. We live in a day when a morbid charity induces many to exaggerate God’s mercy at the expense of his justice, and when false teachers are daring to talk of a “love of God lower even than hell.” Let us resist such teaching with a holy jealousy, and abide by the doctrine of Holy Scripture: let us not be ashamed to walk in the old paths, and to believe that there is an eternal God, and an eternal heaven and an eternal hell. Once [we] depart from this belief, and we admit the thin end of the wedge of skepticism, and may at last deny any doctrine of the Gospel. We may rest assured that there is no firm standing ground between a belief in the eternity of hell, and downright infidelity. We do need to guard against adopting unorthodox beliefs, those which go contrary to Scripture. As Ryle says, once we begin discarding one fundamental tenet of Christianity, we are unlikely to stop there. We depart on the road to questioning more and more of the Bible and discarding more doctrine. Where does one end up then? In a sorry spiritual state wherein we question whether we are saved. More on hell next week. Yesterday’s post discussed Frenchmen who converted from Christianity to Islam. Today’s entry looks at the much smaller numbers of Muslims who convert to Christianity in France, thanks to a September 25, 2015 article in the newsweekly Marianne, the online versions of which can be read here and here. The number of Muslims finding new life in Christ is infinitesimal. Conversion is seen by many Muslim communities as apostasy punishable by death. Where death is not involved, persecution — vandalism and shunning — is not unknown. The experience of the Hussain family in Bradford is a sadly enduring example of this. It’s a dangerous and lonely undertaking. Marianne was able to interview two converts. Ali, whose baptismal name is Jean-Marc, works as a security guard in Paris’s La Defense business district to the west of the city. He is a retired policeman. By baptism I am saved. I am saved, cleansed of my sins. I want to meet God in joy, to die in peace. This is my new life. Another aspect of Islam that bothers him is the inequality between the sexes. So as not to trouble his wife, he does not discuss religion with her. The organisation’s home page asks for prayers for Moh-Christophe, who had surgery on a heart valve during the summer and is in a special rehabilitation clinic at this time. Fortunately, Marianne was able to interview Moh-Christophe well before he had to be rushed to intensive care in June 2015. In the early 1960s, he began listening with fascination to early morning radio programmes on Christianity. He made sure not to turn on the radio before his father left the house at 5:30 a.m. to work in a factory. By 1962, at the tender age of 13, he had fallen ‘in love with Jesus’. Today, he works not only with Muslims converting to Christianity but also with Christians whose children are fascinated by Islam — and jihad. He told Marianne of the appeal of Islam for young Christians or those without religion: anti-materialism, utopia through the ummah (Muslim world), dreams of saintliness and finding a point of reference in life. Moh-Christophe emphasised that, whereas conversion to Islam is done by taking a simple vow in front of two witnesses anywhere, conversion to Christianity — particularly the Catholic Church — involves a good grounding in the Gospels and a long, deep spiritual journey. Priests, more interested in inter-religious dialogue, discourage our conversions. They don’t want to get Muslims’ backs up. It is estimated by people like Moh-Christophe, sociologists and other researchers into these new converts that 90% lie below the radar for survival. Some move to another community to begin a new life, sometimes changing their names. Others outwardly appear to be Muslim and keep their Christian practice private. Above all, they ensure their relatives abroad never find out about their conversion. Marianne concluded their investigation by saying that Catholic laity and clergy are at odds about how to handle conversion. Lay people want an organised programme of open evangelisation: dedicated stalls at local markets (ubiquitous in France) complete with volunteers on hand for discussions, pamphlets and copies of the Catholic catechism. However, French bishops are very reluctant to go down this route — even though French Protestants are evangelising! As, of course, are Muslims. Let us pray that Catholic clergy in France wake up soon and find some bottle. (‘Courage’, for my American readers). We can also pray that Mo-Christophe recovers soon. His people need him. Many thanks to loyal reader Llew, who sent in the link to the Spiked article cited below! The UK Parliament will be debating assisted dying in September 2015. Over the past few years, several high profile cases have come to light of older Britons who have ended it all with professional help. Sometimes this was because of terminal illness, however, not always. In August 2015, university lecturer and author Kevin Yuill wrote an article for Spiked — the UK’s libertarian, secular humanist/atheist site — about the curious case of retired nurse Gill Pharaoh. Pharaoh was 75 and relatively healthy when she died on July 21, 2015, at the LifeCircle clinic in Switzerland. Yuill says she was ‘healthy’, but her final entry states that, in recent years, she’d suffered an attack of shingles, ongoing tinnitus and joint pain. A lot of other older people have these ailments, too. But she wanted to end her life her way. people to remember me as I now am – as a bit worn around the edges but still recognisably me! But how was she to know what she would be like in five or even 15 years’ time? Only the Almighty knows that. Maybe she would have continued to age gracefully apart from physical complaints which are entirely normal, albeit annoying, aspects of growing old. originates from a god in whom we have no belief. Pharaoh blogged about her decision-making regarding ending her own life. She also gave a interview to The Times (Murdoch paper, ergo paywall), summarised in the Daily Mail. Yuill says she was searching for validation and recognition. He introduces his article with a précis of Christopher Lasch‘s excellent 1979 book, The Culture of Narcissism. If you can buy or borrow a copy, it will be more relevant today than when it was written. I read it in the early 1980s in the US and was shocked. Needless to say, my work colleagues told me the man was talking out of his hat. Yet, how correct he was. His book warns about attention-seeking behaviour which demands that everyone else acquiesces to one’s wishes. What Pharaoh wanted was a change in the law. The Daily Mail article quotes Pharaoh as saying that her mother had dementia and that, if she could have done so, she would have helped her mother die. My family members and I have had parents with dementia and Alzheimer’s, for shorter and longer periods of time. None of us, even the agnostics, ever thought of putting them to death. Another high profile case in Britain was that of 68-year old Bob Cole, who ended his days at the Dignitas clinic in Switzerland on August 14, 2015. Cole’s wife Ann Hall, who suffered from progressive supranuclear palsy, had died at the clinic 18 months before. I should be able to die with dignity in my own country, in my own bed. The law needs to change. How do you change the law? People have got to take a stand. So that’s what I’m doing today. The politicians need to have the guts to change this law. Just bite the bullet. Accept that the British public want this change. If they don’t it will be forced upon them because the public feeling is overwhelming. Is ‘public feeling overwhelming’ on this issue? In any event, there are British organisations promoting legalised assisted death. Dignity in Dying were informed once Bob Cole died. Gill Pharaoh had been a member of the Society for Old Age Rational Suicide (SOARS). What role do such groups play in encouraging personal publicity for past and future high profile assisted suicides? Yuill has a point when he says that people who want to terminate their lives through assisted dying should do so quietly with no publicity. Only days after my reader Llew forwarded me the Spiked article, I read an article in The Telegraph which left me speechless. ‘”There is nothing sacred about suffering”, insist faith leaders in assisted dying call’ shocked me. That is bad enough. However, there are Christians, too: Baroness Richardson, first female President of Methodist Conference, along with prominent Anglicans such as Lord Carey, the former Archbishop of Canterbury, The Bishop of Buckingham, the Rt Rev Alan Wilson, and ‘a handful of Anglican clerics’. It should be noted that the Church of England officially opposes euthanasia. These men and women, Jews and Christians, are opposing the government — and God. far from being a sin, helping terminally ill people to commit suicide should be viewed simply as enabling them to “gracefully hand back” their lives to God. There is, they insist “nothing sacred” about suffering in itself and no one should be “obliged to endure it”, they insist. How can one ‘gracefully hand back’ one’s life to God by terminating it? He gave us life. Only He can legitimately end it. It is not up to us to decide when that moment is. Not so long ago, this sort of attitude would have been rightly condemned. Well, Rob Marris (Labour) will have his Assisted Dying Bill debated within the next few weeks. May life-respecting and God-fearing heads prevail. Baroness Finlay of Llandaff, co-chair of the Campaign group Living and Dying Well, which opposes a change, said: “The law exists to protect us, all of us and especially the most vulnerable among us, from harm – including self-harm. “People who are terminally ill are especially vulnerable. As a society we go to considerable lengths to discourage and prevent suicide. I couldn’t agree more. In 2014, I pointed out that children’s euthanasia was already legal in the Netherlands, Luxembourg and Belgium. There’s no minimum age in Belgium and in the other two countries a child only needs to be 12 years old before he can request his own death. These kids could be disabled, suffering from terminal illness or have a curable condition such as anorexia. This is a very slippery slope. Returning to the Spiked article, Kevin Yuill pointed out that, on the other end of the age spectrum, a Dutch citizen’s initiative Uit Vrije Wil (Out of Free Will) received 117,000 letters of support in 2010 for a relaxation of the Netherlands’ law which would allow persons over the age of 70 to end their own lives just because they were tired of living! In 2005, Gallup’s poll on the subject found that a majority of Christians in the United States support euthanasia: 75% of Catholics, 70% of Protestants and 61% of Evangelicals. A majority of Catholics and Protestants also support physician-assisted suicide, PAS — 60% and 52%, respectively — although only 32% of Evangelicals do. It’s pretty clear that the rise of secularism in the 1960s, possibly before, brought about legalised control over life and death, beginning with abortion. A person can be his own god, making decisions only the Almighty rightly has control over. Does God pardon Christian suicide? can be forgiven like any other sin. in a time of extreme weakness. … we question the faith of those who take their lives or even consider it seriously–it may well be that they have never been truly saved. In which case, there is the issue of the second death at Judgement Day leading to eternal condemnation. Furthermore, one who repeatedly considers suicide is practicing sin in his heart (Proverbs 23:7), and 1 John 3:9 says that “no one who is born of God practices sin.” And finally, suicide is often the ultimate evidence of a heart that rejects the lordship of Jesus Christ, because it is an act where the sinner is taking his life into his own hands completely rather than submitting to God’s will for it. Surely many of those who have taken their lives will hear those horrifying words from the Lord Jesus at the judgment–“I never knew you; Depart from me, you who practice lawlessness” (Matthew 7:23). So though it may be possible for a true believer to commit suicide, we believe that is an unusual occurrence. Someone considering suicide should be challenged above all to examine himself to see whether he is in the faith (2 Corinthians 13:5). There are many web pages with notional Scripture verses against suicide which includes assisted death. However, most of the verses are not very helpful. The best page I have found is Adrian Warnock’s on Patheos. Warnock is a physician and author. He also serves as part of the leadership team at Jubilee Church London. Any Christian who is considering ending his own life through assisted dying would do well to read Warnock’s selection of Bible verses, meditate on them then pray fervently and frequently. This illness does not lead to death. It is for the glory of God, so that the Son of God may be glorified through it (John 11:4 ). For godly grief produces a repentance that leads to salvation without regret, whereas worldly grief produces death. (2 Corinthians 7:10 ). His page has several more. Christians who listen to their clergy and leaders who advocate for euthanasia or assisted dying are in danger of dying an everlasting death. As they are making a considered, premeditated decision, they are guilty of murdering themselves. Clergy advocating assisted dying would do well to examine their hearts humbly before the Lord, repent and publicly say they were wrong. They could be sending Christians — and themselves — to an eternal death. Theirs is such an irresponsible and reprehensible position to adopt. No one knows why the Lord sends us debilitating and lengthy illnesses. However, He works everything to His purpose. In these situations, Christians must have hope, faith and pray whilst seeking palliative relief. The basic problem is — and this seems to include certain clergymen, too — lack of faith, a love of self and pride in one’s own abilities and decision-making. I’ll return to these themes soon in another context.